Completed in 2004, Shelby Hall’s architecture employs the composition and materials of the American Federalist period. Its design compliments the traditional architecture of the campus, and evokes the memory of the original University plan of 1831. The facility was built in the shape of a pentagon with an entrance reminiscent of the original campus rotunda, complete with a dome that rises 80 feet above its surroundings. The side extensions of Shelby Hall’s pentagon-shaped layout were designed to recall the end buildings of the old campus layout. The three-story, 200,000 square foot complex is divided into five sections. These include two teaching wings and three research wings, arranged so that students and faculty can easily move between classrooms, offices, and research areas. The research wings are designed to support groups of scientists, often from different disciplines, working as a team. To allow for maximum flexibility, research labs and support offices are modular and clustered along corridors, with faculty offices at the end of each research wing. Laboratory units are assembled into “neighborhoods,” allowing for a variety of space assignments and cooperative projects. A central courtyard formed by the five interior sides of the pentagon is filled with an oval lawn and sitting areas. 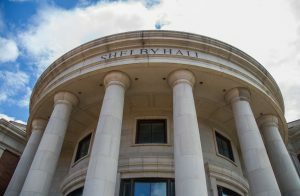 Shelby Hall is the home of the University of Alabama Chemistry Department. Several of the building’s architectural features are designed to recall chemical structures. The back two staircases were inspired by molecular structures. The ceilings in the stairwells are hexagon shaped skylights reflecting the structure of benzene. The right and left spiral staircases at the back of the building are curved as the right and left part of the DNA chain. A mirror plane dissects the building thorough the rotunda, reflecting the chiral nature of many molecules.